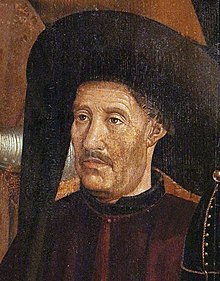 Prince Henry the Navigator (1394–1460) was a prince from Portugal, the third son of King John I of Portugal. He was called Infante Dom Henrique in Portuguese. He was never a navigator himself. He got his name because he organized many ocean voyages on which lands were found. He is seen as the man who started the Age of Discovery. He also opened a navigation school in Portugal, so the technology of tools and ships could be made better. His explorers discovered the first shipping routes directly from Europe to Asia for the Portuguese monarchy. ↑ "Most famous for..." www.thornr.demon.co.uk. Retrieved 2008-06-14. This page was last changed on 25 January 2018, at 18:22.